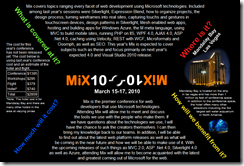 Next year, I’m trying to get my employer to pay for me to go and visit the Mix 2010 conference in Las Vegas. While anyone that knows me would probably think I’d have some ulterior motive in wanting to go (re: it’s in Vegas) the fact is that Mix covers a lot of things I’ve become really interested in lately. Namely, front end web design, design standards, Silverlight, and ASP .Net MVC. As I wanted to demonstrate my desire to go to mix in a creative way, I made this. I wanted to play around with relative placement that I first read a bit about in the Text Flow section of this article and do something that was applicable. I’m sure there are some much better ways to do this but it was a fun way to screw around and spend a Sunday.